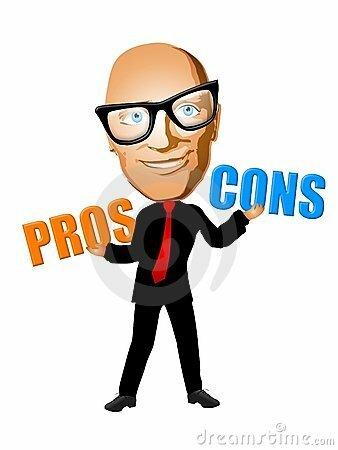 [패턴영어] Weigh the pros and cons of + ~ing. Weigh the pros and cons of + ~ing. ~하는 것의 장단점을 잘 따져 봐. Weigh the pros and cons of asking. 물어보는것의 장단점을 잘 따져 봐. Weigh the pros and cons of canceling. 취소하는것의 장단점을 잘 따져 봐. Weigh the pros and cons of protesting. 반대하는것의 장단점을 잘 따져 봐. Weigh the pros and cons of paying cash. 현금을 지불하는것의 장단점을 잘 따져 봐. Weigh the pros and cons of getting it done. 그걸 끝내는것의 장단점을 잘 따져 봐. A: This is a complex issue. Where does Bill stand? A: 이거 복잡한 문제네. 빌의 입장은 어때? B: Weigh the pros and cons of asking. B: 물어보는 것의 장단점을 잘 따져 봐. A: I'd like to know his thoughts, but I don't a lecture. A: 내가 알고 싶은 건 그의 생각이지, 훈계가 아니라고. * This is a complex issue. : 이거 복잡한 문제네. * Where does Bill stand? : 빌의 입장은 어때? * Weigh the pros and cons of asking. : 물어보는 것의 장단점을 잘 따져 봐. * I'd like to know his thoughts. : 그의 생각을 알고 싶어. * I don't need a lecture. : 훈계는 필요 없어.